While there are numerous ways to take illegal drugs, injection is preferred by some drug users because the effects are experienced rapidly and within seconds. However, this rapid high brings with it numerous risks as does the method of injection itself. Dependency can occur more readily with the injection of illegal drugs. The rapid surge of the drug in the bloodstream leaves the user experiencing an intense and short-lived high, thereby putting them at a higher risk of dependency, both psychological and physical. The user then craves more of the drug and if he or she does not obtain the drug, withdrawal symptoms can be severe, leaving the user's body essentially craving even more of the drug. Each successive use increases the user's tolerance and leads to a dangerous cycle of injection drug use. In addition, injection drug users face a higher susceptibility to infections, inadequate nutrition, suicide, overdose and interactions from combining drugs - either illegal ones or prescription medications. 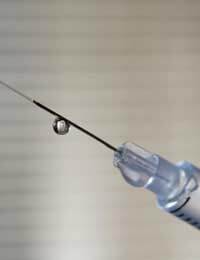 While the best way to reduce the risks associated with the injection of substances is to cease drug injection, it is important to acknowledge that users may not choose to do so and instead, harm reduction techniques should be employed. Ideally, those who use injection drugs should receive drug counselling to help them to stop the use or they may consider entering an in-patient or comprehensive out-patient substance abuse program. Since the sharing of needles is a key transmission method for HIV and Hepatitis C, drug users should learn not to reuse or share syringes or associated paraphernalia used to prepare the drugs for injection. The syringes should also be sourced from a reliable place such as a pharmacy or needle exchange program. When a user intends to inject a drug, he or she should use a clean, sterile syringe and discard it immediately after use. Ideally, sterile water will also be used to prepare it or alternately, water from a reliable source. Associated equipment such as the container used to 'cook' the drug should be new or sterile and a new filter should similarly be used for each injection. Whenever possible, a user should carefully clean the injection site with a fresh alcohol swab before injecting the drug. It is also recommended by health professionals that drug users obtain regular testing for diseases such as HIV and Hepatitis C, both of which are commonly transferred via injection drug use. Drug use brings an enormous range of risks but those associated with injection drug use can be particularly dangerous. While it is hoped that injection drug users seek out resources available to help them stop using completely, it must be realistically acknowledged that some drug users will continue to inject drugs. Instead, harm reduction methods are vital to helping protect injection drug users from many of the dangers associated with this type of drug delivery. If you are struggling with addiction, try to seek out local resources such as drug counselling as well as obtaining sterile needles from a local needle exchange or pharmacy program. For those who are concerned about a friend or family member who is using, try to approach the person gently and empathically without passing judgment. You can explain what resources are available and provide encouragement for the user to seek out support for the addiction as well as make use of safer injection practices.